On the stations website a ministry spokesman shares "After 17 years of ministry in the Knoxville area, the time came to consider future ministry opportunities for the stations. This led to conversations with Educational Media Foundation, non-profit parent of both the K-LOVE and Air 1 Radio Networks and a solution that would keep Christian music on both stations." EMF plans to program Air 1 on 89.1 and K-LOVE on 88.3 FM on January 1, 2011. By a 3-2 vote Tuesday, the FCC passed the so-called "Net Neutrality" rules aimed at prohibiting internet service providers (ISPs) from discriminating between Internet traffic. Supporters of "Net Neutrality" have been disappointed by the proposed rules, saying they heavily favor the industry they are supposed to regulate. Democratic Commissioners Mignon Clyburn and Michael Copps both voted with Chairman Julius Genachowski in favor of the new rules, despite saying they believed the Open Internet Order to be too weak. Republican Commissioners Robert McDowell and Meredith Attwell Baker voted against it. WRBS/Baltimore (95.1 Shine FM) Promotions Director Erin BranhamI checks in with HisAir.Net with some good advice for Christian Radio. Erin says she saw a contest on Facebook by one of their artists this past week that violated Facebook’s promotions guidelines, and she's seen other stations run contests that violate the promotions guidelines as well. She's wondering how many stations/labels don’t know that Facebook has guidelines that govern contests and they have recently updated their promotions guidelines... Here’s the link to Facebook’s guidelines: http://www.facebook.com/promotions_guidelines.php. On the heels of their second American Music Award win for Contemporary Inspirational Artist, MercyMe recently garnered the National Christian Audience Song of the Year and Christian AC Song of the Year with “All of Creation” according to Billboard magazine. The track dominated Billboard’s AC Monitored chart for 11 weeks, the longest run at No. 1 in the band’s career. Along with the Song of the Year nod, MercyMe is closing out 2010 with a bang in other ways as well. Having wrapped their successful “The Generous Mr. Lovewell” tour, the Dallas-area locals had a dream come true when they were recently asked to open a Dallas Cowboys Football game by singing the National Anthem for Sunday night football. Russian government authorities have shut down The New Life Radio Satellite Network (Moscow, Russia) FM affiliate in the far north Russian city of Norilsk saying the local station did not produce enough programming on a daily basis to satisfy broadcast license requirements. The radio affiliate was not able to raise sufficient funding to support local radio staff, leaving them little choice but to rebroadcast the satellite signal of New Life Radio/Moscowair 100% of the time. Local VOAR station 96.7 went on the air Dec 1st on the air serving the Similkameen Valley. VOAR is a service of the Canadian Christian Radio ministry owned and operated by the Seventh-Day Adventist Church in Newfoundland and Labrador. The local rebroadcast is a 24/7 rebroadcast sponsored by the Adventist Church of Cawston/ Keremeos. 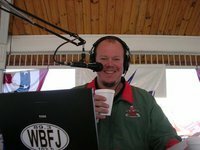 WFSH/Atlanta (104.7 The Fish) morning show "Kevin and Taylor in the Morning" started off a Christmas fund raiser for Food for the Poor that has now reached $243,000! That means that Food for the Poor will be able to build new, building coded, cinder block homes for over 80 displaced families in Haiti. Christian broadcaster John Fabrin is confident of raising $2.4 million in a week to save the Rhema Broadcasting Group. The group, which broadcasts Life FM, Rhema and Southern Star throughout New Zealand, needs the funds in order to renew its licenses for the next 20 years. "The licenses will run out in April next year, but the Government want the payment six months early," RBG chief executive Mr Fabrin said yesterday. Fabrin was in New Plymouth yesterday meeting with the group's regional members, calling on them to spread the word that they needed to raise a total of $6.4 million. Having already raised $4m, Fabrin said he was confident the other $2.4m could be raised by next Friday. "There will be a way, it's not our intention to let the licenses go," he said. Christian Hit Radio Satellite Network (CHRSN) morning host Brant Hansen is in Afghanistan this week, packed with loads of baby blankets and baby hats, all knitted by listeners, delivering them to the Cure International Hospital to be given to moms and babies who need them this winter. Brant was also asked to do “kangaroo care” duty in the hospital (pictured left) with baby Zakura who is only 2.5 pounds). Kangaroo care is spending time just snuggling with babies, to help encourage growth and development. Watch the video here http://www.youtube.com/user/MorningsWithBrant. Brant says, “We thought showing God's love for these Muslim women and children was a beautiful counterpoint to the Koran-burning issue. We talked a lot about what "Christian" means, and how that word is never more appropriate than when we love the least, and love our enemies." Update: J93.3 Listeners should not notice any change in the sale of WVFJ/Atlanta to Provident Broadcasting. Three of Providents principals are also on the board of buyer Radio Training Network. RTN, owners of His Radio and Joy FM, has a family of Christian music radio stations including 18 stations located across the Carolina's, Georgia, Alabama, Missouri, and Florida. Provident and RTN also hold the construction permit for a new FM in Claxton, GA and have LMA's for WLFA/Asheville, NC and WLFJ/Greenville, SC. The station currently uses the voicetracking services of some RTN talent such as Jayar and Steve Swanson. Salem Communications Corporation released its results for the three and nine months ended September 30, 2010. Compared to the quarter ended September 30, 2009: Consolidated Total revenue increased 4.4% to $51.4 million from $49.2 million; Operating expenses decreased 21.0% to $43.2 million from $54.7 million; Operating expenses excluding impairment of indefinite-lived intangible assets, cost of denied tower site and abandoned projects and loss on disposal of assets increased 6.7% to $43.2 million from $40.5 million; Operating income from continued operations increased to $8.2 million from a loss of $5.5 million; Net income increased to $0.3 million, or $0.01 net income per diluted share, from a loss of $4.6 million, or $0.19 net loss per share in the prior year; EBITDA increased to $11.9 million from a loss of $0.2 million; and Adjusted EBITDA decreased 2.1% to $12.3 million from $12.6 million. KSBJ/Houston announces additional staff members for it's new HD-2 youth station NGEN set to launch on Nov 18th. Carlos Aguiar has been named program director for NGEN, Bruce Goff will serve as the NGEN production director, Kristin Haskett joins the station as digital strategist and Drew Wilson comes on board as western region manager. Most recently, Aguiar was MD/on air at WVBM/Tampa (Spirit FM). Goff comes to KSBJ from The Sound of Life Radio Network in Kingston, NY where he worked as production director, hosted a weekly rock show and managed web content. As NGEN’s digital strategist, Haskett will manage online communications of the youth-oriented station. New western region manager Wilson will support the NGEN on-air team through creative on-air campaigns as well as grassroots community outreach. Most recently Wilson served as promotions director for KSWP/Lufkin. Steve Swanson reports that WAFJ/Augusta just completed their fall Sharathon. All though the effort took one day longer than planned, 101% of the goal was attained. To GOD be the Glory! Salem Music Network™ announced today that CCM artist Jaci Velasquez will be the new co-host of The Family Friendly Morning Show™ with Doug Griffin airing weekdays from 5-9 am CT. Velasquez said, “I'm so excited to be a part of such a lovely legacy that is the Family Friendly Morning Show™! Having the opportunity to share my love for my family, music and ministry is the core of what this show is about. I’m overwhelmed with joy at this new endeavor!” No stranger to the Contemporary Christian airwaves, the bubbly and always engaging Velasquez will be sharing moments as a wife and mother of two little boys. Each morning will offer listeners the opportunity to start their day with Doug and Jaci as they welcome special guests and connect with listeners over topics of the day. The God's Country Network has gone off the air. Rodney Baucom says “As a listener-supported format, this Christian Country format didn't connect with enough listeners to sustain the expenses of the broadcast. We do believe that in better economic times this format of music would flourish. Please understand that this is not a decision from the owners/producers of the God's Country format, but a business decision of the owners of your local radio station." Christian Hit Radio Satellite Network (CHRSN) General Manager Faron Dice has announced that “Mornings with Brant” has been added on “The New J 103.3”, in the Cagayan de Oro City, Philippines. Cagayan De Oro is known as “The City of Golden Friendship” and has a population of over 500,000. This represents the first-ever international affiliate for WAY-FM and CHRSN. Brant says …”We are REALLY excited about this. You never know how the Lord is going to work, and this is evidence of that. I seriously get goose bumps thinking that God would allow us to play a role in someone's life, on a daily basis, in a place like Cagayan De Oro. This is going to be fascinating.” J 103 representative, John DeCleene says “The New J (DXJL) is thrilled to have "Mornings with Brant" in Cagayan de Oro City. Most Filipinos are fluent in English, and many have already commented that they'd like to copy Brant's accent!" Christian Hit Radio Satellite Network (CHRSN) General Manager Faron Dice has announced that the CHRSN show “Total Axxess with Wally” has surpassed 1,000,000 YouTube views on the Total Axxess YouTube channel. The Total Axxess YouTube channel features videos of artist interviews in the Total Axxess studio in Nashville, as well as videos covering Wally’s antics both in and out of the studio. It can be found at www.youtube.com/totalaxxesswally online. WAY-FM Media has announced a new LMA relationship with Cumulus mainstream Classic Rock station WLCL/Sellersburg, IN that will increase the WAY-FM presence in the Louisville market. October 1st, WAY-FM programming began airing on 93.9. With the addition of 93.9 signal WAY-FM will have two outlets in the market for the next few months before plans for 105.9 WAYI are announced later this year. WAY-FM Media Group President Bob Augsburg says “This is a very exciting move for us. WLCL has full market coverage and even serves a good portion of southern Indiana. Now contemporary Christian music fans will be able to tune in to WAY-FM anywhere in the market as well as on their commutes to the outlying suburbs”. Future plans for WAY-FM’s existing 105.9 outlet will be announced later this year. More news at WAY-FM Media Group President Bob Augsburg has announced several changes coming for Colorado’s WAY-FM. The primary change is focused on the Denver area, as well as Northern Colorado. In August, WAY-FM purchased KKHI/Centennial (101.9), the former smooth jazz outlet. This commercial FM station serves the Denver metropolitan area. Then in early September, an application was filed with the FCC to add mainstream rocker KRKU/Loveland (93.9), with the format switch to WAY-FM occurring later this fall. KRKU serves Fort Collins, Loveland and Greeley. Combining the coverage of these two stations will replace the coverage of KXWA//Loveland (WAY-FM’s current Denver signal @ 89.7) which is being sold to Calvary Aurora, a large Denver area Calvary Chapel church led by Pastor Ed Taylor. 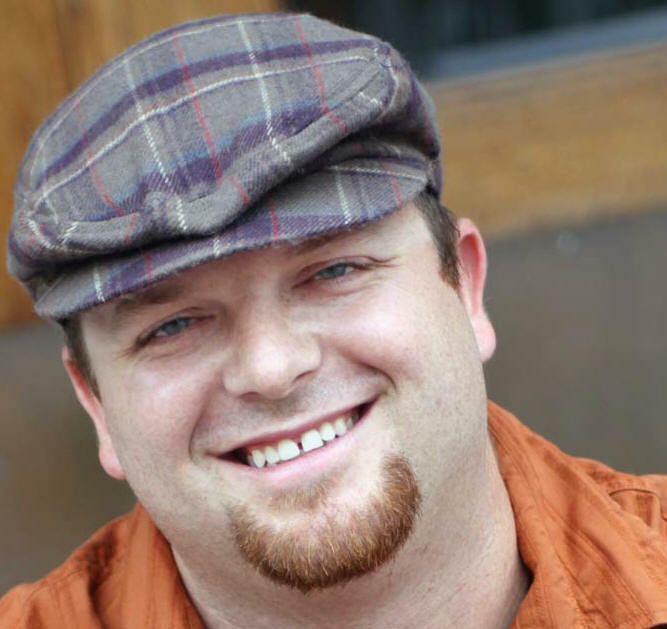 Collin Lambert has been named VP Moody Radio. Moody COO Ed Cannon says "We are blessed to have Collin in this new position. While many other qualified candidates were considered, his skills and strategic management approach are uniquely suited for the job. Collin brings a diverse set of experiences to this new position and his programming background equips him well to lead Moody Radio into the future." His Radio's Rob Dempsey joins Matthew West on tour. Not to sing. But, to share his story. In four select cities Rob shares his story of being a homeless teenager. God used a dumpster and a Walkman to bring an addict and alcoholic to being a Christ Follower. Matthew is currently on tour sharing the stories that inspired his new CD The Story of Your Life. 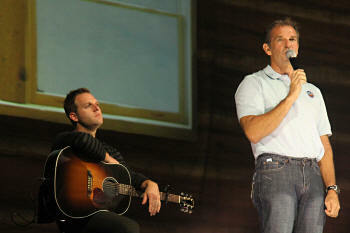 Picture: His Radio's Morning Man Rob Dempsey on stage with Matthew West sharing his story. KSBJ/Houston will launch a new online and on-air digital station November 18. The new station, NGEN (NOW generation) will officially launch at the TobyMac Winter Wonder Slam Tour in College Station. Using state-of-the-art HD technology, NGEN will provide listeners a format similar to listening to their personal MP3 players with sound quality and music selection. A “listener oriented” station, NGEN will provide an outlet for listeners to have an active role in the station with music selection and discussion topics. Featured artists will include TobyMac, Skillet, Fireflight, Group 1 Crew, Lecrae, Relient K, Superchick and Switchfoot. Seattle-based Crista Broadcasting takes over newly acquired KFMK/Austin (105.9 The River) Monday, Sept. 20 and will change the name of the station to Spirit 105.9. Crista, which owns KCMS/Seattle (Spirit 105.3) purchased the station for $6.25 million from Clear Channel Communications Inc. “It’s a complete startup. We are building a new station, from building the studios and technical area to hiring a general manager,” said Stan Mak, vice president and general manager of Crista Broadcasting. “It represents a significant investment on our part.” Mak anticipates that it will take time for the station to turn a profit. “No doubt, we’d like to think many of the current listeners of The River will stay when we make the change, and we hope many of the advertisers that support The River will support us,” Mak said. As reported on HisAir.Net (9/7) Crista has hired Tim McCoy as its GM. McCoy, who most recently served as vice president and general manager of Univision Austin, is putting together a core management team. The station is looking to hire an advertising director. Crista has permission to speak with four former employees of The River, but so far no job offers have been made. When fully staffed, the station will employ 20 people. reportedly MD Steve Etheridge will exit the station Friday 9/17. HisAir.Net was nominated this year for the "Industry Impact".... we didn't win but are truly honored for the nomination. CMB Executive Director Linda Meyers won the award and we congratulate her for her continued work for the industry. KTIS/Minneapolis announced that they are making their interactive PrayerWorks tool available to radio across the country. PrayerWorks uses a station’s reach to connect listeners that have prayer concerns with listeners willing to pray. While "prayer pages/walls" are available elsewhere on the internet, this program is unique. On most prayer pages, the person submitting a prayer request simply posts...and hopes. But with PrayerWorks, they receive notification every time someone has prayed for them and often, it's accompanied by a note of encouragement. The site has logged thousands of prayer requests in the year it’s been online at KTIS, and over 217,000 prayers have been prayed (indicated by the user clicking on the request once they’ve prayed for it). In addition, over 6,000 notes of encouragement have been sent. Because there are costs associated with hosting multiple prayer databases and providing support, there is a minimal subscription fee, based on market size. WLAB/Ft. Wayne (STAR 883) is growing as they just expanded into new areas for the first time with translators in Orland at 91.3 and a fill in signal for Fort Wayne at 88.7. As a part of that growth, a much needed prayer request was answered as Shelby Lynn joins the team to fill the Co-host role with Ace McKay. Lynn joins the WLAB team Sept. 13th. STAR 883 also received honors being voted Best Station in Ft. Wayne for the 2nd year in a row by the News-Sentinel Newspaper. Readers voted for their favorites which also saw Afternoon Host Melissa Montana voted Best Personality in Ft. Wayne with Morning Show Co-Host Ace McKay in 3rd place for a second year in a row. This fall a new signal will be launched in Auburn, In.